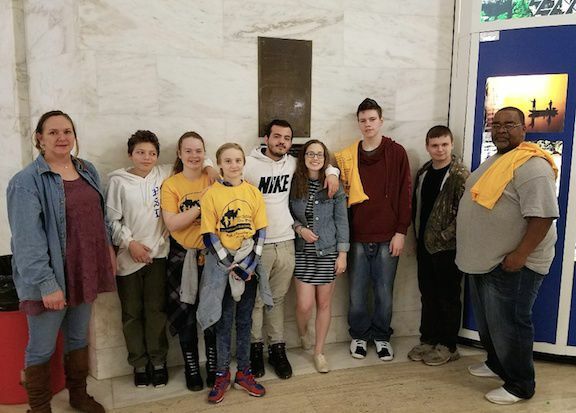 Students in the Southern Appalachian Labor School's Accent Education after-school program at the SALS Community Center attended the West Virginia Legislature on Monday, Feb. 26. They are shown here at the McDonald's in Smithers en route to Charleston. Students in the Southern Appalachian Labor School's Accent Education after-school program at the SALS Community Center in Beards Fork attended the West Virginia Legislature on Monday, Feb. 26. That day was officially proclaimed by Gov. Jim Justice and the legislature as Families Leading Change Day. Students in the Southern Appalachian Labor School's Accent Education after-school program at the SALS Community Center in Beards Fork attended the West Virginia Legislature on Monday, Feb. 26. That was the day officially proclaimed by Gov. Jim Justice and the legislature as Families Leading Change Day. Co-sponsored by the Our Children Our Future Campaign, the students participated in an educational day of celebrating parent and family leadership for advocacy in schools. Activities included hands-on STEM (Science/Technology/Engineering/Math) activities, exhibits and demos, music, art performances, kids cooking and physical activities. That was followed by advocacy activities as the students spoke with their state legislators about issues of concern. Support for the SALS programs would be appreciated, officials stress. People are invited to visit www.sals.info or the Southern Appalachian Labor School Facebook page.